The good folks at Attack Squadron are readying their next release, a 1/72 Kaman K-MAX. 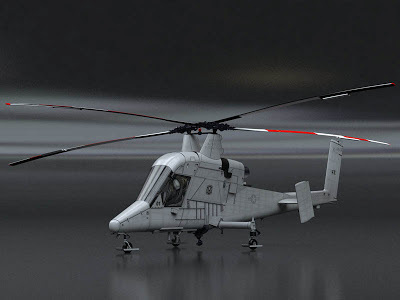 If you're not familiar with the K-MAX (I wasn't), it's a helicopter that was designed for heavy lift operations and has been adapted for use in hazardous situations by removing the pilot, converting it to an unmanned vehicle. The US Marine Corps has been using two in Afghanistan since December 2011, having flown more than 1,000 missions. If you're wondering if this is a significant aircraft, you should know that it was nominated for the 2012 Collier Trophy. Attack Squadron seems to have an keen interest in these tiny, unmanned aircraft. They previously released kits of the MQ-8B Fire Scout and RQ-7B Shadow in 1/72 scale (and the latter in 1/48 scale), and now they bring us what may be one of the most interesting releases of the year. UAV's are changing the way nations fight crime, defend their borders, and conduct warfare, so these kits will likely be of great interest to modelers.